Today we’re going to look at a very brief history of Conceptual Art and Fluxus and it’s relationship to “New Media” or the sorts of technologies we engage with today in digital media and screen-based media. As we don’t have a lot of time, we can only touch on these vast histories and look at a few of the artists that have been influential and are accepted as major proponents of contemporary art. This is meant to be a starting place for you to hopefully delve further into the artists mentioned here today to find out more about them. The relevance of “movements” such as Conceptual Art and Fluxus to performance, installation, screen media and how we use digital media technologies today is important to be aware of. There is a focus on concepts and ideas in this kind of work, not a focus on formats or traditional media – for example, rather than thinking of art as commodified types like “painting” or “photography” or “video”. There is also a more open use of media and technologies of all kinds, and even use of objects or elements not considered “high art”. These movements can inform us about how we use our media now - social media & games culture for example, audience participation & interaction with art and media, and many aspects of popular contemporary culture... as we will see. All in all, the creative act is not performed by the artist alone; the spectator brings the work in contact with the external world by deciphering and interpreting its inner qualifications and thus adds his contribution to the creative act. This becomes even more obvious when posterity gives a final verdict and sometimes rehabilitates forgotten artists. Conceptual Art - what is it? Influenced by Dada, Duchamp and the writings of philosopher Ludwig Wittgenstein, Conceptual Art is a term given to a range of works generally created around the 1950s and 1960s, although it is still a term used now and there may be current artists that claim to be conceptual, or to create conceptual art. Conceptual art emerged in the 1960’s, the term either first used by Edward Kienholz, in the late 1950s or by Henry Flynt in 1961 in a Fluxus publication - different sources make different claims, so the history is not exact. The philosophies of Conceptual Art include the notion that art is about ideas rather than material things. The idea of a work is more important than it's physical expression. Conceptual Art later evolved into a different meaning when the Art and Language group, headed by Joseph Kosuth, adopted it. This group believed that Conceptual art was created when the analysis of an art object succeeded the object itself. Today, Conceptual Art is sometimes used as a simplistic term for many kinds of art that claim to be about ideas and concepts rather than the more modernist ideas of aesthetic and medium - although a conceptual artwork may indeed be about the media used ("The media is the message", Marshall McLuhan). Yves Klein, International Klein Blue 191, 1962. It is important to note that Joseph Beuys was one of the artists that began, with George Maciunas, to explore something that eventually became known as Fluxus. Fluxus - what is it? Long long ago, back when the world was young - that is, sometime around the year 1958 - a lot of artists and composers and other people who wanted to do beautiful things began to look at the world around them in a new way (for them). They said: "Hey! - coffee cups can be more beautiful than fancy sculptures. A kiss in the morning can be more dramatic than a drama by Mr. Fancypants. The sloshing of my foot in my wet boot sounds more beautiful than fancy organ music." And when they saw that, it turned their minds on. And they began to ask questions. One question was: "Why does everything I see that's beautiful like cups and kisses and sloshing feet have to be made into just a part of something fancier and bigger? Why can't I just use it for its own sake?" 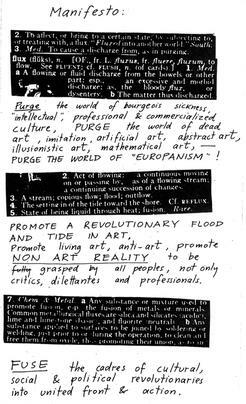 Fluxus isn't really an art movement or genre that you can define as easily as “Impressionism” for example. It is often difficult to define Fluxus, as many Fluxus artists claim that the act of defining the movement is, in fact, too limiting and reductive. There are many artists that don’t call themselves Fluxus artists, but make works that fall into that category. What we understand as Fluxus began in the 1950s but there are artists now that work with some of the ideas that began over 60 years ago. Fluxus is a global avant-garde movement, which had a strong focus in New York City. Fluxus artists did not agree with the authority of museums to determine the value of art, nor did they believe that one must be educated to view and understand a piece of art. Fluxus not only wanted art to be available to the masses, they also wanted everyone to produce art all the time. It is interesting that today, many of the significant Fluxus works are held by institutional galleries and museums - the very establishment they originally railed against. Fluxus artists embraced Duchamp's ideas of art using everyday objects and elements of chance or contingency in the creation of artwork. Artist/musician/performer John Cage was a leading figure in the development of these ideas. Fluxus is intermedia: Fluxus creators like to see what happens when different media intersect. They use found and everyday objects, sounds, images, and texts to create new combinations of objects, sounds, images, and texts. Fluxus is fun. Humour has always been an important element in Fluxus. Nam June Paik, Family Robot: Grandmother (left) and Family of Robot Grandfather (right) 1986, single channel video sculpture with vintage television and radio casings and monitors. This film is considered a Surrealist work, but as you can see, John Cage traversed art movements as did Marcel Duchamp. This famous music piece involves the performer sitting at the piano in complete silence for 4 minutes, 33 seconds. One of the main reasons for studying Fluxus and looking at all these works here today is that many of these artists naturally gravitated towards technologies such as video, audio and digital media. Also, as many of the Fluxus works were “evental” – performance or installation based works that existed only at certain times and places. Media such as photography, film and video were important documentary tools that have helped to preserve traces of these artworks. “Happenings”, events and performances from the 1960s and 1970s can directly be seen to inform certain current practices using the Internet and digital technologies – consider “flash-mobbing” for example, and many group participatory “events” or practices such as "Mail Art" (where artists used the postal system to distribute artworks), that take place on social media such as Facebook & Twitter. The sense of experimentation and play that is a key element in Fluxus works is perhaps one of the reasons that it has endured as a “movement”. The elements of humour and playfulness in Fluxus and the “everyone is an artist” attitude, combined with the immediacy of our current ubiquitous Internet technologies, allows for all kinds of engaging artworks to be created. There are some that consider that Fluxus ended when George Maciunas died, but many of the original Fluxus artists consider that the ethos of Fluxus continues and cannot be so simplistically terminated by the death of one member. Fluxus is more valuable as an idea and a potential for social change than as a specific group of people or a collection of objects. Using the Fluxus Workbook (which I will print and bring to class), each student will pick up a scattered page from the Fluxus workbook, and find an example of a Fluxus score/work to share with the class. The important thing is that the work is the one you find the most resonant on that page. You might be drawn to it for any number of reasons, humour, poetic nature, or the objects that it employs. We will all read these aloud to the class. This exercise will hopefully help you to get ideas flowing for your Fluxkits. Save the piece you have chosen and stick it in your journal as the start of your research into the sixth assessment task. Who are some of the artists mentioned today that were/are part of the Fluxus movement? What are the philosophies of Fluxus? How is Fluxus relevant today in contemporary arts/design practices? What current "movements" or "genres" of art and design are directly influenced by Fluxus? What is "new media" & is it really "new"? Can you find some examples of new media artists/designers to investigate? Each member of the group must be involved - you may have different tasks or roles, but everyone must contribute something to the Fluxkit, and be able to justify their participation in the project. We will be asking you as a group to assess your own conduct and productivity as a group member. It's great to come up with some good ideas, but you must be able to realise these ideas as a cohesive project that makes a strong statement. You must be organised to complete this task in the allotted time span. That means coming to class and doing the work! You must present the work in a professional manner and be prepared to talk about what you did - how and why you created your Fluxkit. Your piece should be in the spirit of Fluxus, and should demonstrate that you have understood the ideology, and have gained a depth of knowledge about the movement and the artists linked to it. Please note: you will be assessed as a group and individually so part of the mark will be for the overall piece and part of the mark will focus on each individual's performance within the group. This means that if one member of your group has not been participating or doing their fair share of work, their mark will reflect this and will be different to the marks of group members that worked harder.